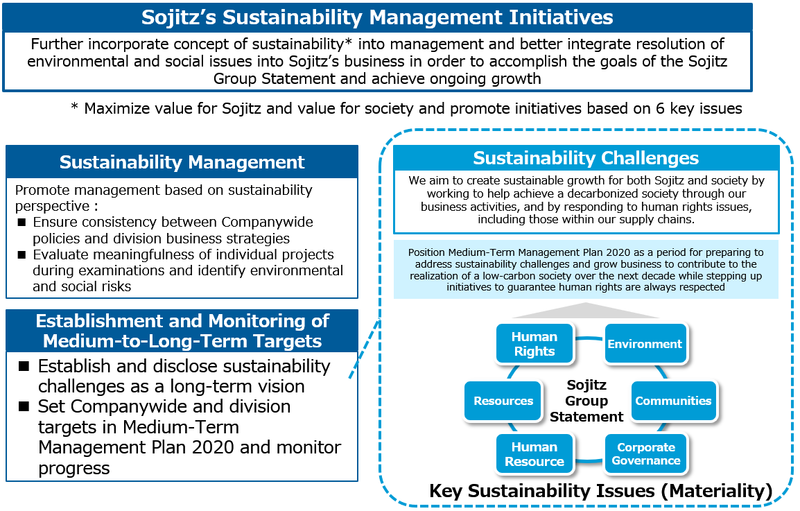 Medium-term Management Plan 2020 –Commitment to Growth- is the new three-year plan established by the Sojitz Group to begin in April 2018. 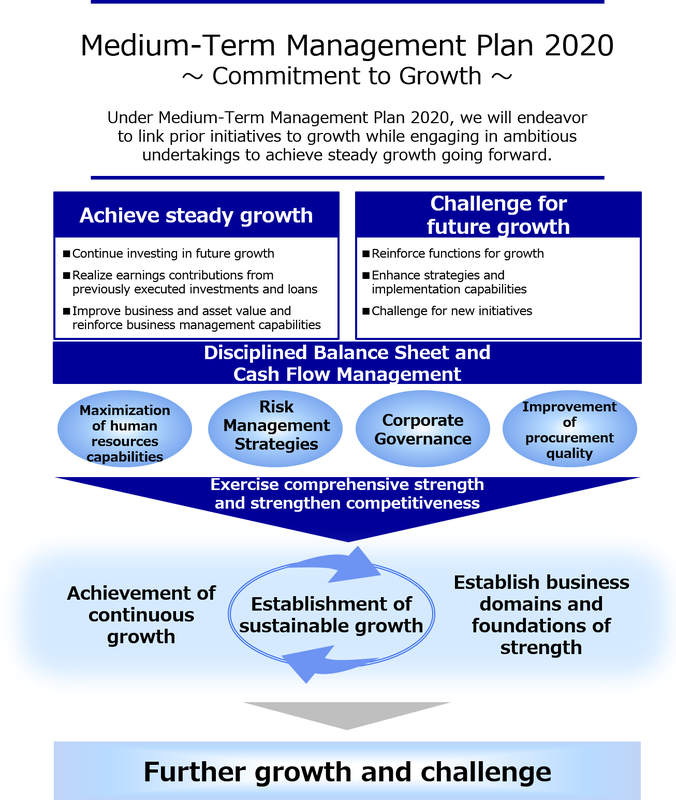 Under the new plan, we will continue initiatives on the growth track put forth by Medium-Term Management Plan 2017 while utilizing the assets acquired during the period of this plan to expand earnings foundations and realize steady growth. 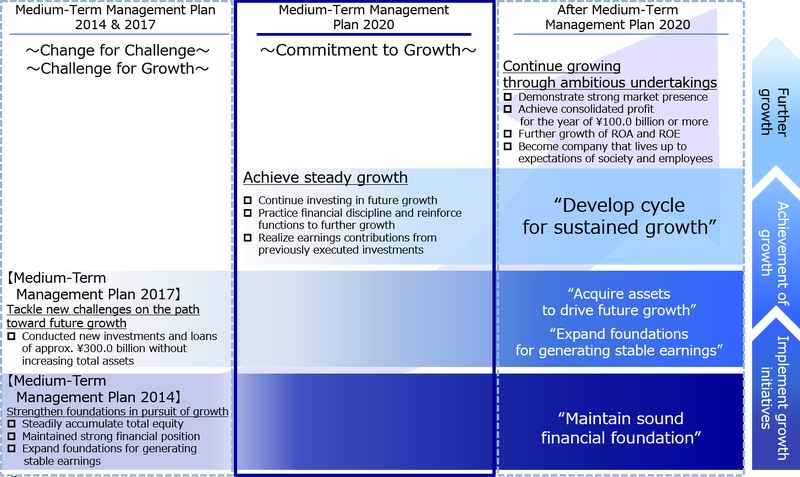 At the same time, we will strengthen Sojitz’s functions to develop a cycle for ongoing growth in order to facilitate future growth. In this manner, we will strive to improve corporate value by making Sojitz into a company that continues growing through ambitious undertakings. 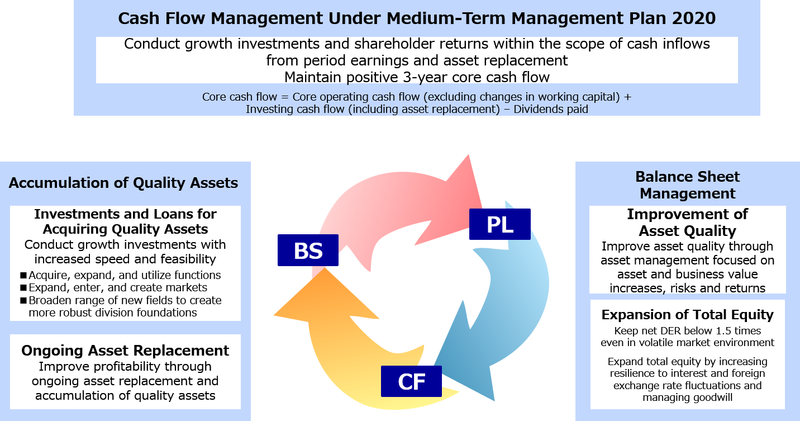 We maintain positive growth cycle as follows; generating cash and profits through accumulation of quality assets and asset replacement, accumulating total equity by profits with cash, and investing for acquiring further quality assets and returning to shareholders based on generated cash and accumulated equity. 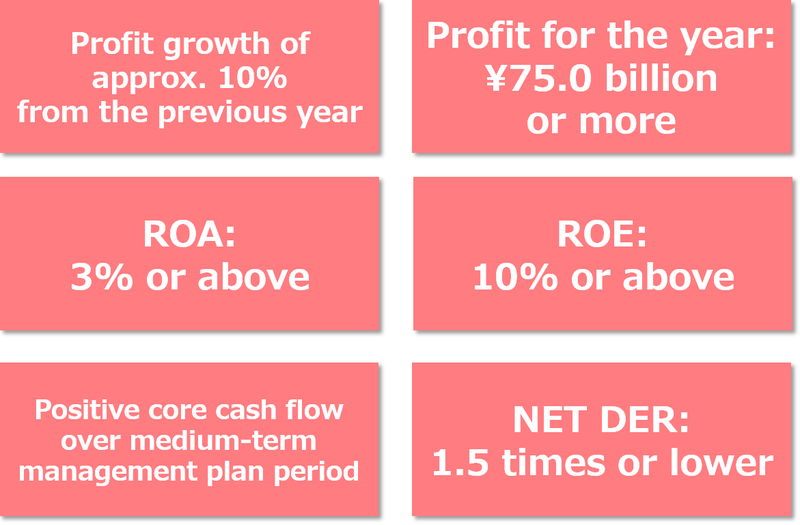 Sojitz recognizes that paying stable, continuous dividends is a management priority, together with enhancing shareholder value and boosting competitiveness through the accumulation and effective use of retained earnings. Under Medium-Term Management Plan 2020, our basic policy will be to target a consolidated payout ratio of 30%. Please refer to the following presentation material and appendix for more details regarding the Medium-Term Management Plan. *Important Note Concerning the Appropriate Use of Business Forecasts and other This document contains forward-looking statements based on information available to the company at the time of disclosure and certain assumptions that management believes to be reasonable. Sojitz makes no assurances as to the actual results and/or other outcomes, which may differ substantially from those expressed or implied by forward-looking statements due to various factors including changes in economic conditions in key markets, both in and outside of Japan, and exchange rate movements. The Company will provide timely disclosure of any material changes, events, or other relevant issues.